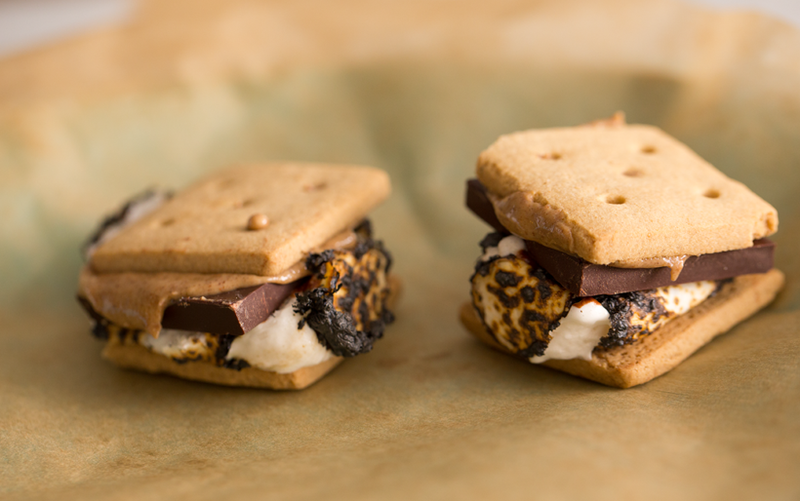 S'mores and summer are best buddies. The summer sun slides down the fading blue sky and sinks into the horizon, allowing twinkly stars to perk up their sleepy heads and spin into the cool evening sky. Then comes a crackling summer bonfire and a big cozy blanket to huddle under. 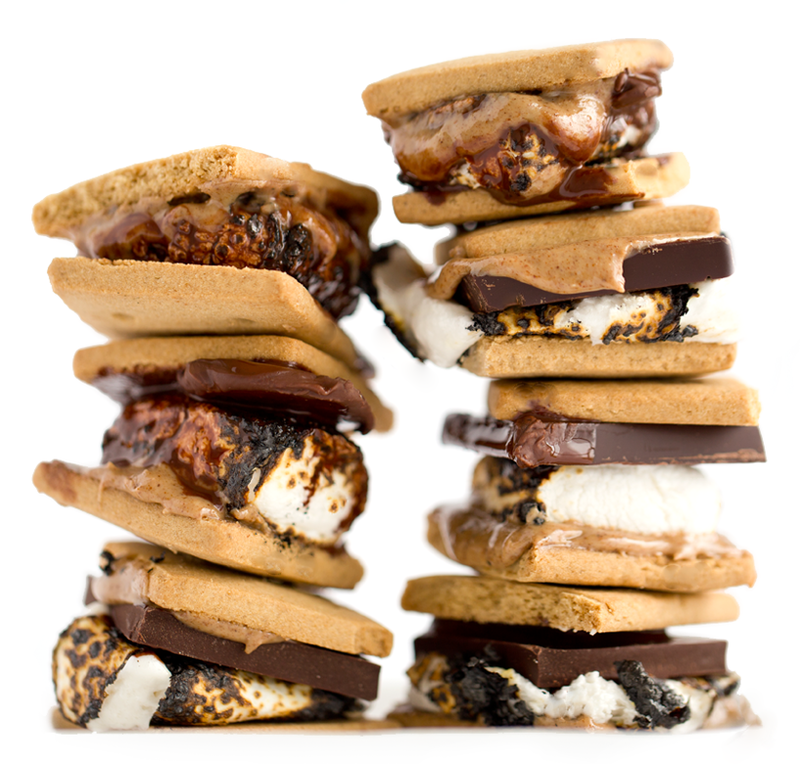 A platter of s'mores ingredients, and instant smiles appear. "S'mores!" I actually don't think you can say s'mores without having a bit of excitement in your voice. "S'mores!" or shmores. 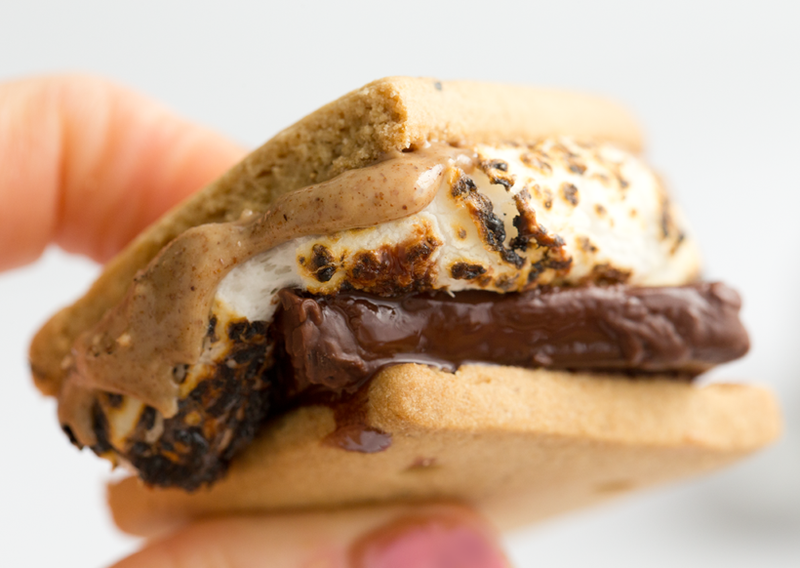 So today's vegan s'mores have a dreamy nut butter spin: Almond Butter S'mores. Plus, get my ideas for 10 summer fun activities + a cool summer footwear giveaway! * Grahams: I used Kinnikinnick Foods, S'moreables graham crackers. If you don't mind gluten or honey, there are plenty of options for you in any grocery store. Most brands do contain honey. 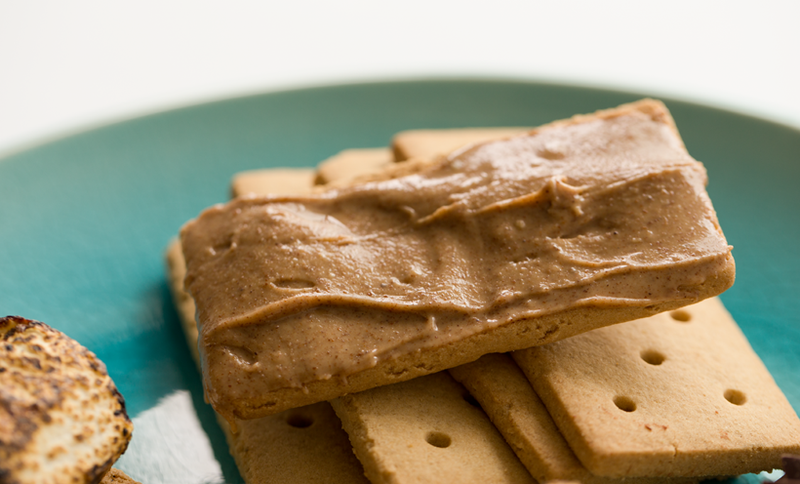 If you want to plan ahead and get the best of the best, try Sweet and Sara's vegan grahams. * Chocolate: anything that does not contain milk or milkfat, etc. Dark chocolate is usually a good bet, just check the ingredients for "contains: milk." And a few brands of chocolate bars will even say 'certified vegan,' which is helpful. * Nut butter: easy! Try almond, peanut or sun butter. There are sooooo many nut and seed butter options out there today. Yay. Or you can DIY it: sunflower butter, almond butter. Fun Idea.. Instead of doing the nut butter and chocolate on their own, you could just smash a vegan nut butter cup with the marshmallow! I am SO trying that next. Slather almond or peanut or sun butter on one side of the grahams. This classic summer treat has a vegan and nut buttery spin! Chocolate, vegan marshmallows and almond butter. Slather the almond butter on six of your graham squares. Add the chocolate squares on top of the almond butter. Roast your vegan marshmallows until dark brown to black on the outsides. 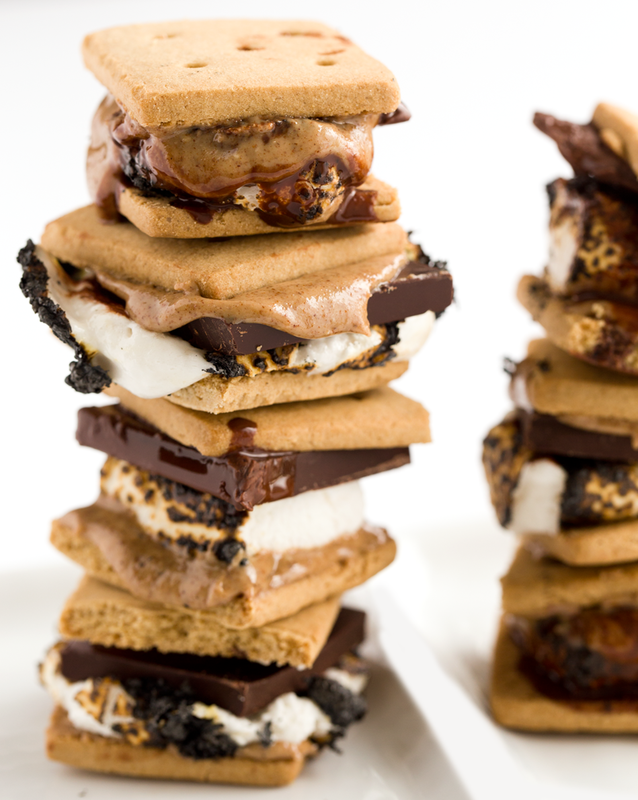 Place the roasted marshmallows on top of the chocolate or in between the chocolate and nut butter (your call). 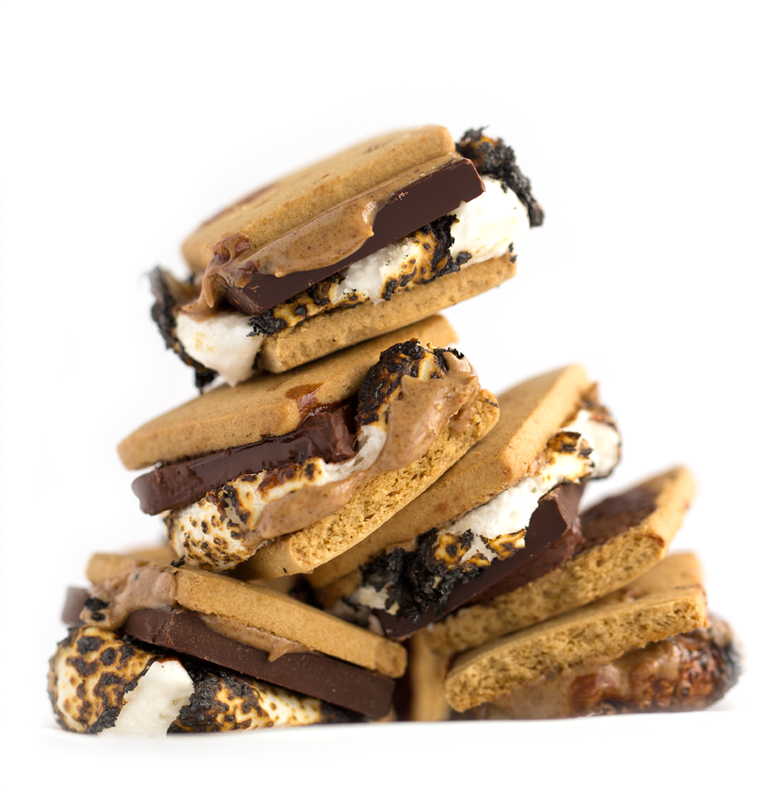 Add the top graham cracker and smash the smores into place with your fingers. This helps melt the chocolate from the hot marshmallow smushing into the chocolate. Enjoy! 1. S'mores! Today's recipe of course! 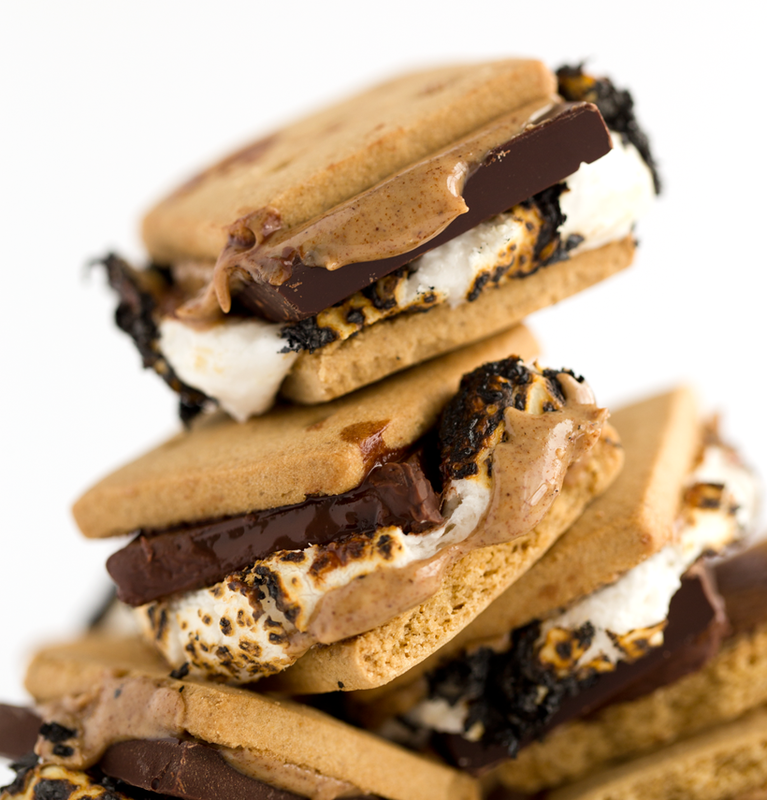 Making these vegan s'mores while camping, on the beach or simply at home on a snuggly summer movie night or after dinner treat. 3. Summer Outdoor Movies. I love finding local parks and other venues that host outdoor movie nights! If you are in Los Angeles, here is a great list of events from Time Out. Other cities, try googling and you should get some good results! 4. Group Fitness Class. Summertime is a great time to add a few new social activities to your calendar. So challenging yourself to sign up for a group fitness class (even just once to try it!) is a fun personal goal. Try yoga, kickboxing, HIIT classes, spin and more. Even if you are not a 'group exercise' person, I bet you will still enjoy doing a group class once in a while just to change things up. TIP: Try to find a class where you think you will fit in. Seek out classes with your fitness level and fitness goals in mind. For example, if you want to chill out and meditate with yoga, choose restorative yoga or something lighter -- instead of a power or acro-yoga style class. 5. Take a Hike. Hiking is a fun way to get exercise while getting outdoors in the sunshine. Free vitamin D! Connecting with nature has been shown to improve your mental outlook and may even help with anxiety and depression. Bottom line, moving your body out in nature just makes you feel good! Try for a hike that gives you full sensory experiences - birds chirping, dusty dirt paths, beautiful scenery and an ever-changing trail. 7. Sunshine Meditation. This one is one of my favorites because anyone with a sunny day can do it. Head outside during the sunniest hours of the day, find a cozy spot to sit, bring your sunnies and just meditate as the sun warms your body. Do this for even just 5-10 minutes. No phones. No magazines. No distractions. Just you and the warming sunshine. Take in its energy and feel its glow. Think of all the trillions of people who that same sun has warmed over the years and feel connected to this planet, this solar system, this galaxy, like never before! 8. Staycation! If you have flexibility for an overnight, take a trip slightly out of town for a one night staycation. Staycations are nice because if you drive a few hours you don't have to drive the same trip in the same day. You can relllllaaaaxxxx for an evening away. Plus it is fun to check out local-ish hotels and pretend you are a tourist inyour own town. I love HotelTonight and Hotels.com apps for booking last minute hotels. 9. Splash Around. Find some water and splash in it! Ok, so that is pretty vague. You can try a pool, the beach (my fave) or even a sprinkler in your backyard. Slip 'n slides, lazy rivers and even a splashing hose could work too. There is something magical about being warm from the summer sun and them splish-splashing yourself in water. Take advantage and feel that hot and cool energizing feeling! PRIZE: One winner (USA only) will win one pair of Bzees Sea Dogs shoes in their choice of color and size. retail value: $69 Thanks to Bzees for offering up this prize for one of my readers! 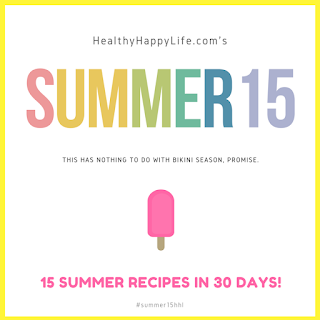 This is recipe #9 in the Summer 15!..